Watchfire Signs, a manufacturer of LED signs and digital billboards, is accelerating its growth in the sports signage market with the acquisition of Buffalo-based HD Sports Boards, a nationally designer and integrator of scoreboards and sports video displays. As a total solutions provider for sports stadiums and arenas, HD Sports Boards brings experience in design, engineering, project management, procurement, and commissioning of LED video displays, fascia boards, message centers, scoreboards, control rooms, AV systems, and advertising and entertainment systems to the Watchfire portfolio. 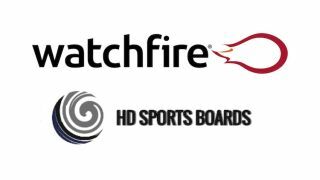 Bob Ferrulo, president and CEO of HD Sports Boards, has also joined Watchfire as the new sports market director. Since founding HD Sports Boards in 2010, Ferrulo has led scores of major sports construction projects for such venues as Peterborough Memorial Centre, Peterborough, Ontario; WFCU Centre, Windsor, Ontario; Dort Federal Credit Union Event Center, Flint, MI; CenturyLink Center, Bossier City, LA; and Prince George’s Stadium, Bowie, MD. Watchfire offers a growing variety of indoor and outdoor signage products designed specifically for the sports market, including the Watchfire S16mm, which offers an ultra-high refresh rate and vivid images specifically designed for stadium and outdoor entertainment venues. In addition, Watchfire offers indoor signage with ultra-high resolutions and wider viewing angles for clear images from any seat in the house.